I approach clay the same way I would a drawing, by using similar shapes, and lines to create a composition. The flat shapes, and open spaces within my work suggest that of a two-dimensional influence. However, working with clay I’m able to create a physical sense of depth that can’t be gained with the traditional approach to two-dimensional works. These flat shapes and spaces produce a visual balance, in addition to creating a sense of movement within the piece. The movement throughout the work is implied further by carving into the clay. These marks are forceful at times, as well as delicate, adding to the balance the work gains from the depth between the shapes. The diversity between the drying stages allows for different textures to be made. I’ll work the clay enough to break it at times, but will also gently mark the surface of wet clay. The marks are placed onto the clay intuitively, as is the rest of the building process. I try to embrace the natural decision making I take toward working with clay, and I try not to interfere with how the forms instinctively take shape. My only job I consciously take on is to loosely guide this way of working until the final stages of building. I feel doing this enables the piece to speak more personally to me by engaging my natural instincts with creating. When making the carvings into the clay my intent is also to bring out the rawness of the clay showing it as a rough material. Embracing this aesthetic quality complements the loose approach I take when working with this material. Using a variety of horizontal and vertical lines throughout the work, the piece can begin to reference landscapes. 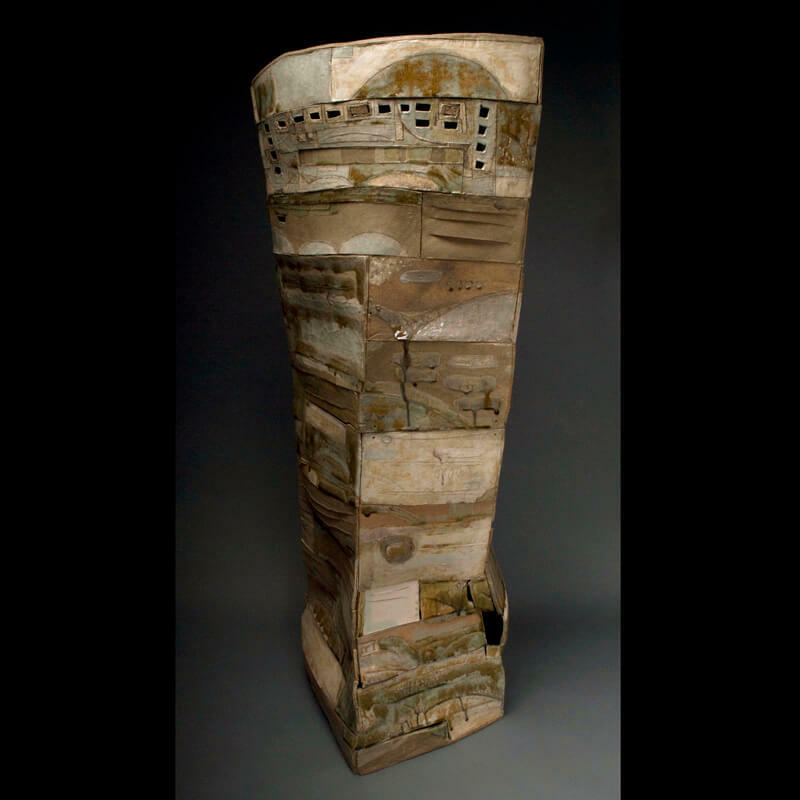 The variation of texture within the artwork is further enhanced with the use of glaze, which offers a smoother texture to accompany the clay that is unglazed, and rough. I approach glazing a ceramic piece the same way I would painting on canvas. I use the brush to make a range of layers, lines, and colors. I apply the first layer of glaze without a definite plan. Then I begin taking some away and adding more again the process of glazing is very spontaneous much like the building process.